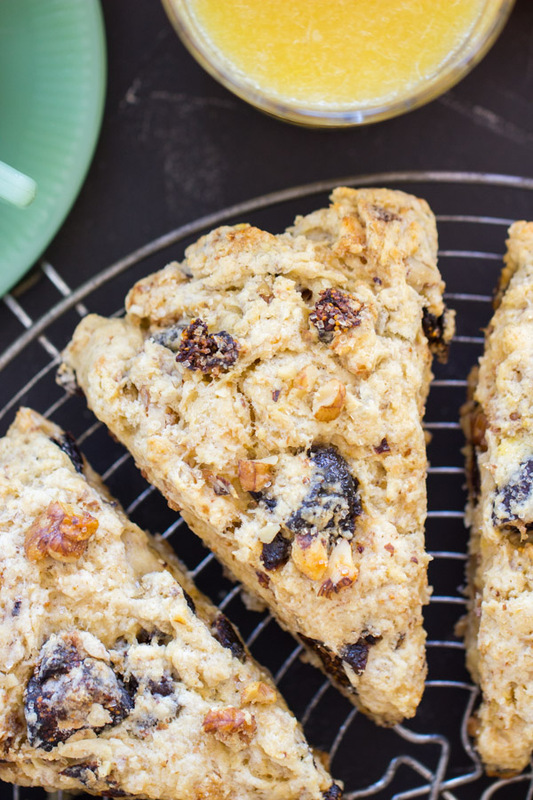 Tender, flaky scones, with crisp edges, and soft middles, are flecked with orange-soaked figs, crunchy walnuts, and a hint of almond! 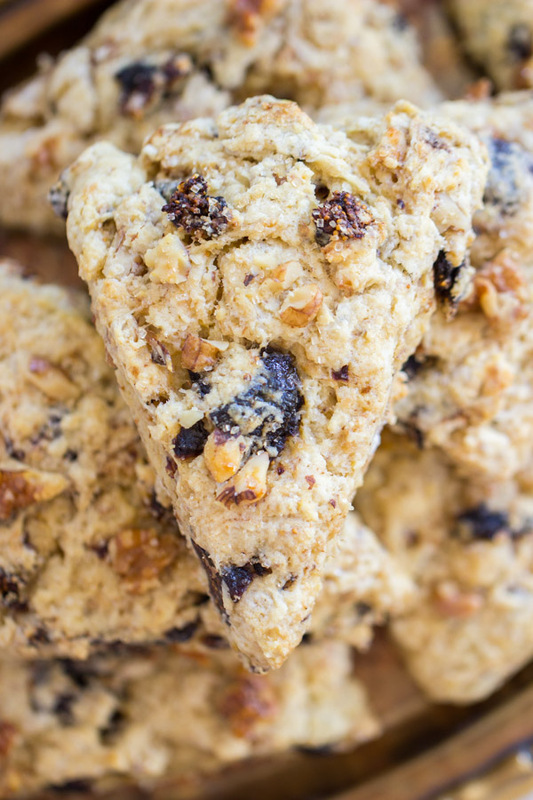 You can have a warm batch of these Walnut & Fig Scones in about 30 minutes! Good morning! 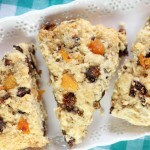 Shockingly, it’s been a minute since I’ve posted any scones recipes. Not since last fall, believe it or not. I never tire of scones, but I don’t want you all to tire of them, so I took a little break! 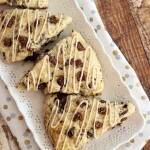 I’m back with these Walnut & Fig Scones! 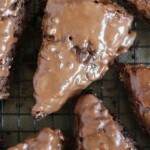 Over the last few weeks, I went into a fall frenzy in the kitchen. I’m tying up loose ends with recipes that I made over the summer, and I can’t wait to flood your feed with pumpkin and apple recipes. Sorry in advance, but I love to go full-throttle with fall baking. No surprise there, I’m sure. What food blogger doesn’t? We flew up to Cleveland earlier this week to visit family for vacation, and spent the day at a nearby park on Monday to watch the eclipse. We made a family day of having an ‘eclipse picnic’ like much of the rest of the country! There was some disappointment among us that the sky wasn’t darker than it was at the peak time of the eclipse, and that it didn’t feel like the coming of the apocalypse, but it was a fun day of family time. What was it like in your neck of the woods? There was certainly a lot of mania surrounding the event. Yesterday we spent the day at Cedar Point, and I think I might’ve talked about this last year, but Cedar Point is MY FAVORITE PLACE ON EARTH! Not an exaggeration. If you love rollercoasters, you *must* go. It’s not an amusement park that just has a few half-decent rollercoasters, and then a bunch of mediocre rides, it’s an amusement park that has about a dozen INCREDIBLE rollercoasters. Then there’s a few ‘okay’ ones, but the bulk of their rollercoasters are simply amazing. We bought their VIP passes, skipped ahead of lines, and rode until we just couldn’t go any more. I hate the thought that I’ll have to wait til next summer to go again, but it will be something to look forward to! We drove back to Erie today, where most of my family lives, and I’ll be here for the week. You might not hear from me much this week, but when I get back, it’s on like Donkey Kong. 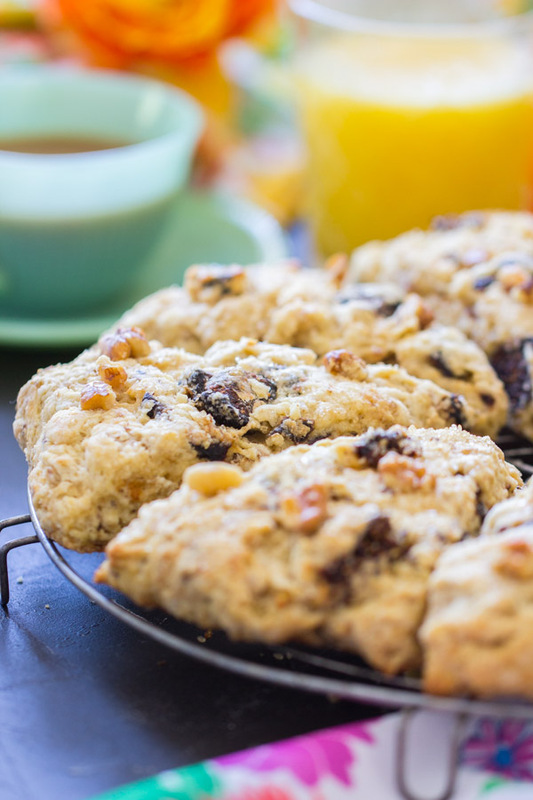 In the meantime, here’s an easy scones recipe to tide you over, these Walnut & Fig Scones. These are really simple, and one of the few recipes on the blog that isn’t ‘over the top.’ I love figs and I couldn’t let summer pass without incorporating them into a recipe. 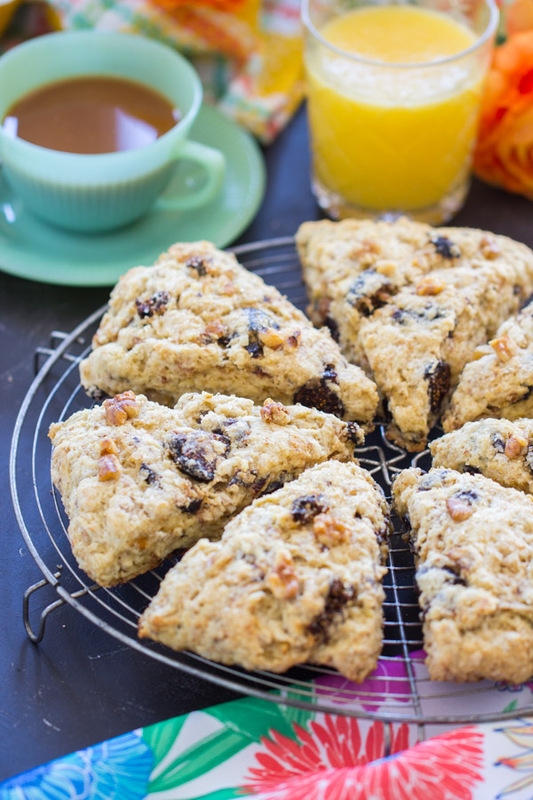 You can have a batch of these Walnut & Fig Scones made in about a half hour, start-to-finish! 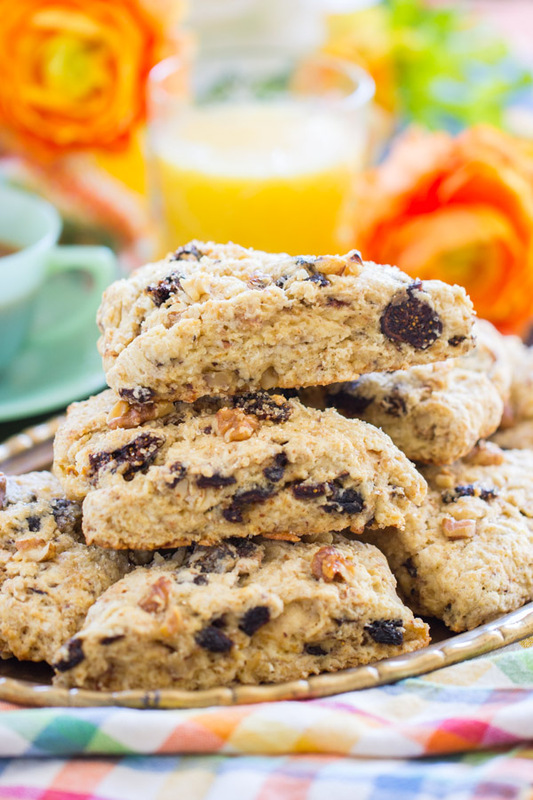 Tender, flaky scones, with crisp edges, and soft middles, are flecked with juicy figs and crunch walnuts! In a small microwave-safe bowl, combine figs and orange juice. Microwave on high for 30 seconds. Stir, and heat for an additional 30 seconds. Set aside to cool while preparing other ingredients. Stir in walnuts to evenly distribute. Drain figs of remaining juice, and toss figs among flour mixture. In a small bowl, whisk together eggs, 1/2 c. heavy cream, and almond extract. Place onto a baking sheet lined with parchment paper or a silicone mat, and carefully flatten the ball into a large disk, about 1-inch thick. Brush each scone lightly with heavy cream, and sprinkle with a pinch of sugar. Want more scones? 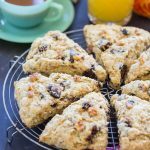 Since it’s fall, I would first check out these Sweet Potato Pecan Pie Scones or these Pumpkin Pecan Scones with Brown Sugar Streusel! Those would get you into a fall mood, for sure. 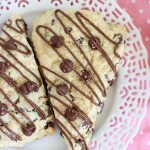 But I have these Hazelnut Chocolate Chip Scones and Chocolate Cherry Mocha Scones with Chocolate Glaze for chocolate addicts! 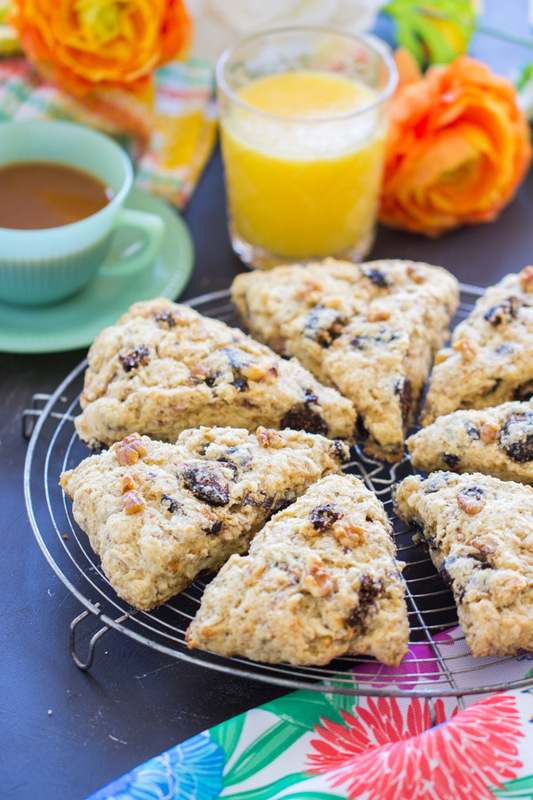 These Cranberry Orange Scones with Orange Glaze are a classic flavor! And my personal favorite are these Brown Sugar Maple Bacon Scones with Maple Brown Butter Glaze. 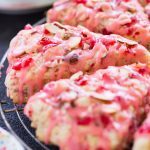 The title is obnoxiously long, yes, but those scones are possibly my favorite recipe on the entire blog!! Oh really? I LOVE Northeast! It’s one of the most beautiful parts of our area, and the WINERIES!!! So wonderful. Have you tried fresh figs with this? Thanks! I haven’t! To be honest, I haven’t worked with fresh figs very much in baking. I’ve only just really eaten them as-is! I would think they’d work pretty well because the recipe ‘plumps’ the figs anyway with an OJ soak, but I can’t say for sure.